The other day we decided to do walk 2: Wanborough to Godalming, which travels through the Guildford area of Surrey. At just over seven miles, the walk was considerably shorter than most of the other ones in the book, no doubt to leave walkers some time to take in the cultural attractions on the way. Most of the scenery was wooded and due to the absence of interesting wildflowers this time of year, pleasant, but fairly unmemorable. Unlike most of the walks, this one crossed a highway, which was a bit frightening. I think the book said “with care, cross the dual carriageway” but neglected to add the bit about making peace with whichever deity one would normally pray to. Across the highway the walk takes you through the middle of a vinyard where the signage warns you to not stray from the path, because the vinyard makes use of high quantities of sprays. We mused for a bit about how global warming has made owning a vinyard in southern England a viable business venture. Though if the grapes in England are sprayed with chemicals that make them dangerous to walk near, I doubt I’ll be purchasing any English wine in the near future. 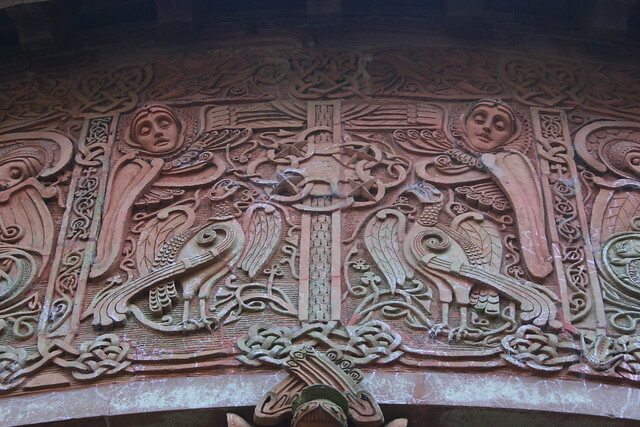 We stopped in at Watts Gallery, which is dedicated to the memory and work of George Frederic Watts, though it also displays works by other related artists and craftspeople. Taken in its entirety, the gallery gives you a little snapshot into a particular period of Arts and Crafts and pre-Raphaelite romantic backlash against the Industrial Revolution. It was interesting to see a selection of work that spanned Watts’ career in a number of styles, some more academic or commercial, some more expressionist and symbolic. I particularly liked the collection of ceramics on display by William and Evelyn DeMorgan, and given that no one seemed particularly fussed about me having my camera out, I took a lot of pictures of them. The gallery also had a temporary exhibit on the work and life of Richard Dadd. Dadd was by all accounts a complete nutter who suffered from what was probably some form of paranoid schizophrenia. After murdering his father he spent the rest of his life in mental institutions. The majority of his ouvre was created while he was living in Bethlem Hospital. His work was really cool to see up close. When you view paintings online it’s so easy to lose sight of the scale at which they exist. His work has so much intricate detail that I’d always assumed that it was much larger than it actually is, but the paintings were surprisingly small and richly textured. The longer you stare at them, the more little details become apparent, and you can see in it the roots of a whole generation of fantasy illustration. 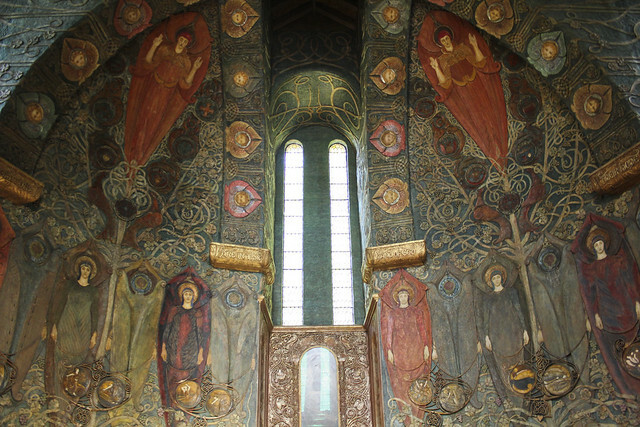 The real highlight of this walk though is Watts Chapel, designed and built by Watts’ wife Mary Fraser-Tytler as a means of training local people to work in crafts and trades. 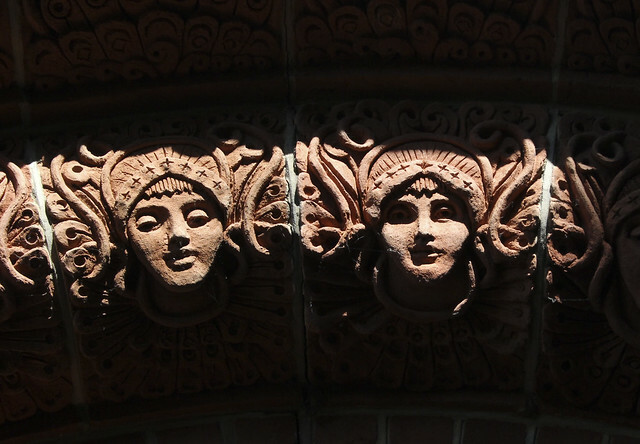 Both the interior and exterior are made of ceramic, richly patterned in Art Nouveau and Celtic revival style. * The Saturday Walkers Club website is an amazing resource for anyone based in London without a car. The site has hundreds of itineraries for walks that begin and end at train stations within two hours of London that have been created by club members and are free to use. Most of them pass by some specific site of interest that you may have missed if you’d just set out on your own. Highly recommended.